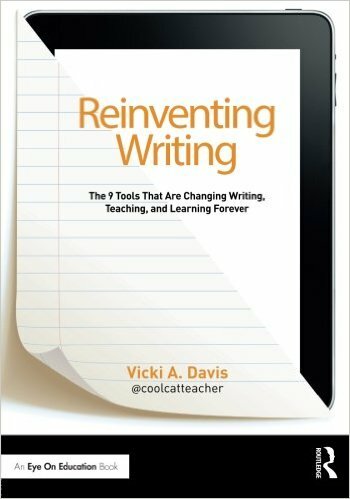 “I came across this book after reading an article on Edutopia by Vicki Davis, an inspirational educator known on Twitter as @coolcatteacher. Vicki’s article is about Digital Citizenship and she shares her 9Ps for proactive knowledge. Within the book (which I have now purchased) there is a chapter specifically dedicated to reinventing citizenship, but there is also so much more and is certainly a book I would recommend to all educators. Edutopia created an associated infographic (see below) which captures Vicki’s 9 key Ps of Proactive Knowledge. Vicki refers to two approaches when delivering digital citizenship curriculum – proactive knowledge and experiential knowledge. (You can read the full Edutopia article here). The proactive knowledge looks at concrete examples of how educators as role models and our students can proactively take ownership of being a safe and responsible Digital Citizens. Experiential knowledge is linking these good practice tips to real life scenarios and activities. Vicki uses current scams and cons in her classroom as discussion points with her students. For example: Snopes (a reference source for urban legends, folklore, myths, rumors, and misinformation) has a section on frauds and scams e.g. phishing and identity theft. Other examples might be gathered from current news articles. There are many ‘newsworthy’ articles where individuals have not been good digital citizens, and there is much to be learnt from others mistakes. 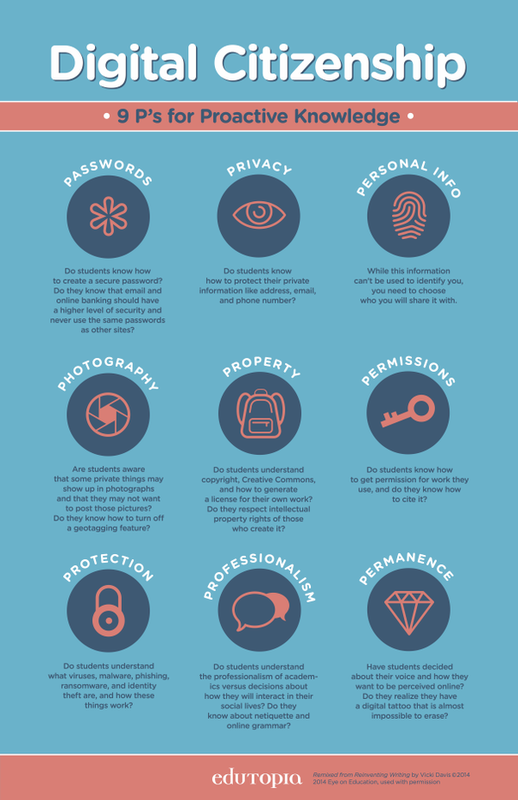 In a hyper-connected world it is important we give our students the scaffolded support and knowledge they need to manage their own personal digital identities responsibly. We need to show them how to positively use digital spaces to connect, communicate and collaborate with others confidently, and consider how this might help to build their professional online profiles. Using social media for example contributes to the digital footprints we leave behind and this can be a positive impression or a negative one. Understanding the impact of these footprints is therefore vital. However whilst talking to students about the benefits and pitfalls of online identities is important, providing activities to critique and develop exemplar profiles can help them to avoid the errors some make. It is also important to give students activities within digital spaces so they can experience these first hand and learn how this can help to develop skills they will go on to use when they look for and find graduate jobs. Creating a LinkedIn profile and joining discussion groups. ‘Listening in’ to how others communicate in this professional networking space is part of the learning experience. Holding a Google hangout or Skype for a group meeting; recording a segment using a screencasting tool and embedding this in a blog post to reflect on and consider their personal contributions. Using Twitter as a search tool to identify companies the students aspire to work for and then consider how those companies are using Twitter as a communication and potential recruitment tool. Vicky captures some really useful points that everyone should consider. It is important to help our students take a proactive approach and realise the importance of each of the 9Ps below.